Our study seeks to discover contamination routes of leaf-cutting worker ants during chemical control by formicide baits. 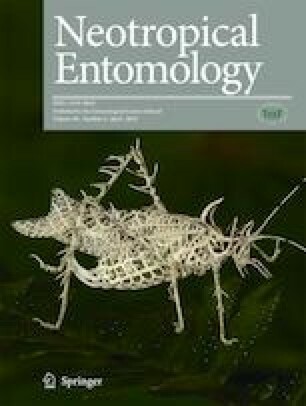 To do so, toxic baits containing fat-soluble tracer dye were provided to colonies of three subspecies of Acromyrmex under laboratory conditions, in order to assess the proportion of dyed workers by size category, as well as dyed internal morphological structures. Results showed that nearly 50% of the workers come into contact with the active ingredient, since the internal structures of their bodies are dyed by the fat-soluble tracer dye within the first 24 h from contact with the toxic bait. In addition, the three subspecies of leaf-cutting ants present a similarity as to the contamination of their workers, probably due to their specialized behavior performed during the growth of the fungus garden with the baits. We conclude that the workers’ pattern of behavior during fungus garden growth was the main means for dispersion of a fat-soluble substance among approximately half of the nest mates in our experiments, serving as a model for further studies on contamination of worker ants with insecticides. L.C. Forti, R.S. Camargo, and A.P.P. Andrade planned, designed, and executed experimental work. L.C. Forti, R.S. Camargo, and A.P.P. Andrade conducted data analyses. L.C. Forti, R.S. Camargo, A.P.P. Andrade, G.C. Catalani, K.K.A. Sousa, A.A.C. Silva, N. Caldato, and V.M. Ramos wrote the manuscript. We would like to thank the Coordination for the Improvement of Higher Education Personnel [Coordenadoria de Aperfeiçoamento de Nível Superior] (CAPES) for the scholarship granted to R. S. Camargo. L. C. Forti gratefully acknowledges the support from the National Council for Scientific and Technological Development [Conselho Nacional de Pesquisa e Tecnologia] (CNPq) (Grant No. 301167/2003-6).